My high school drawing class is getting ready to work on a mini still life drawing assignment. With this drawing project I wanted to create a still life that included color, overlapping shapes, and subtle cast shadows, as well as something that would stay together for a few classes. I have a range of talent in this class from the very skilled student to the "I can't draw" student. I wanted to make all students feel comfortable with the assignment so I leveled the playing field a bit. I brought in a basket full of mismatched plastic picnic utensils. Students were directed to choose 3 or 5 different pieces in different colors. 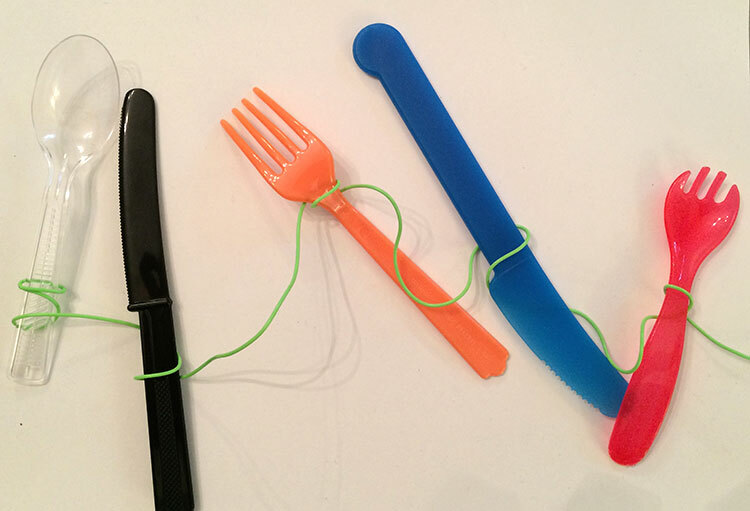 They also chose a colored piece of Twisteez wire to wrap their utensils together in an interesting way. Because students created their own still life, they have already developed a connection with it... even if it's mismatched sporks and knives! Workout #7 Gives you even more ideas for Create, then Draw activities! After the still lives were set up and placed on a white piece of paper in front of each student, they were given a piece of sketch paper for their warmups. The first one we embarked on was to draw simple lines to represent each of the utensils' length and direction. Before starting on a still life, it is important to see it as a whole rather than its individual parts. I help students with this by asking them to only draw lines. We used site measuring to compare the sizes of each utensil with one another. Students quickly caught on and 3 - 5 lines were drawn on their page. I heard absolutely NO complaints, or "I can't" from anyone! Success! Our next warmup involved some paper plates. My students have done this many times before so as soon as I got them out they knew what was about to happen! The paper plates act as blinders. Simply poke your pencil through the middle of the plate. A Blind Contour Drawing warmup is very important to train oneself to really look at what it is you will be drawing. Look at it as if you have never seen the objects ever before. To resist the urge to peak, students use the blinders to hide their paper. 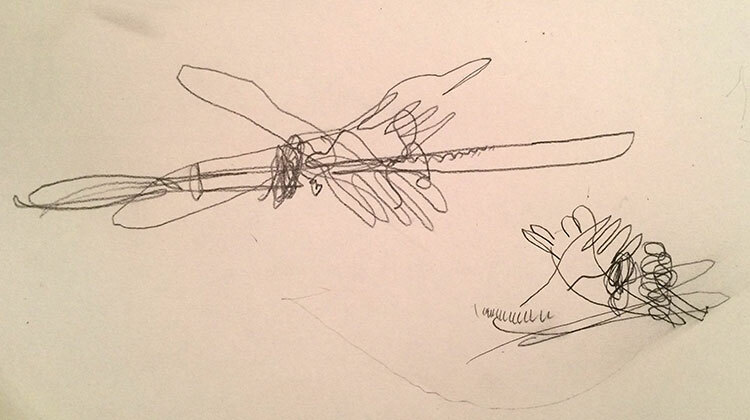 Students are also forced to draw slowly because they are connecting their eye with their hand. They also are encouraged to not pick up their pencil from the page. The drawings are fresh, exciting and something like they've ever drew before. 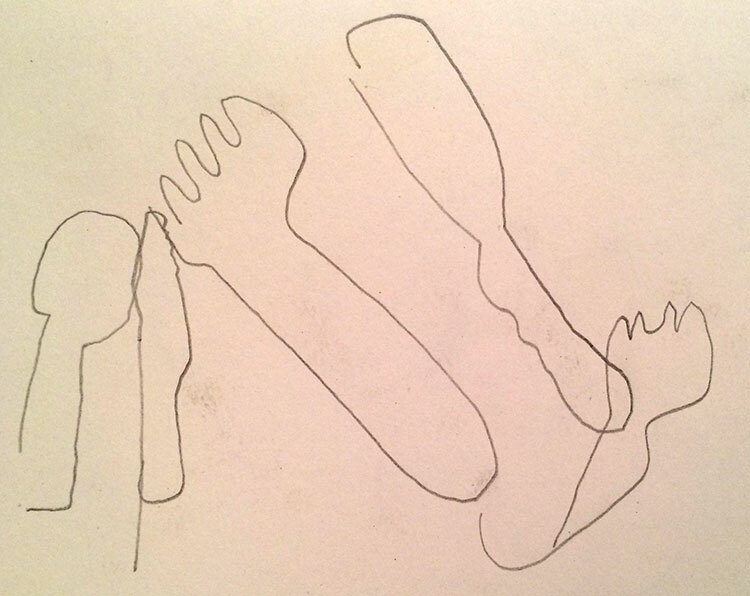 This exercise is especially helpful for those students who like to sketch as they draw a line. Often times I hear, "Well, this is how I draw, I can't draw any other way". With the blind contour line warmup, it's very hard to use a sketchy line. It's wonderful to see them discover a new line come from their pencil! And finally, we did a Blind Blind Contour Line warmup. Students studied their still lives for 1 complete silent minute. During that time, I asked students to move their eye around the still life as if their eye was tracing the objects' outlines. The goal is to record, with their eyes, the memory of the objects' relationship to one another. After that, they closed their eyes and drew. I encouraged them to think positive thoughts as they drew. No one's drawing was going to look perfect or realistic so whatever they were drawing, as long as it was thoughtful, was going to give them a new relationship with their still life and provide them the confidence for an extended drawing. They are now ready to draw their still life. I do still require they draw very light lines to record the direction and proportion of the utensils before adding any details. It is a very important step, so students don't begin drawing too detailed right away. It helps with positioning the still life properly on the page as well as at the desired size. Stay tuned to see how these turn out!